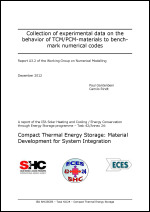 Collection of the Position Paper and all final deliverable papers of the joint task IEA SHC Task 42 and IEA ECES Annex 29. The papers were presented at the SHC Conference 2015, December 2-4 Istanbul, Turkey. They will be published in the proceedings of this conference in due time. 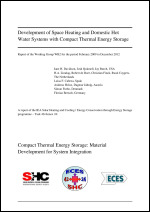 Long-term, compact thermal energy storage (TES) is essential to the development of cost-effective solar and passive building-integrated space heating systems and may enhance the annual technical and economic performance of solar domestic hot water (DHW) systems. 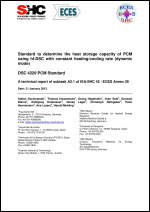 Systems should provide high energy storage density, charge and discharge temperatures that match the heat source used for charging and the intended load, adequate charge/discharge power, and employ storage materials that are stable over many cycles, non-toxic, environmentally safe. Moreover, these systems must compete effectively in the marketplace and therefore should provide an economic benefit compared to conventional heating and DHW systems, which have traditionally relied on sensible water storage. The activities in this working group are aimed at developing and testing numerical models that help to understand and optimise the material behaviour and the dynamic behaviour of compact thermal energy storage systems and components based on Phase Change Materials (PCM’s) and Thermo Chemical Materials (TCM’s). Ultimately, these numerical models could help to find ways to optimise the materials in combination with the system components. The activities in this working group help to lay the foundation for such models. 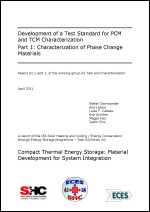 As the knowledge of the behavior of heat storage materials is very essential to design an application it is important to characterize these materials. The important characteristics of heat storage materials are their heat capacity, the thermal conductivity, the density and viscosity all in dependency on temperature. All these parameters are necessary to size a thermal storage or to develop heat exchanger to charge and discharge such storages. Simulations are also very often used to analyze applications or components of it and their interaction with the storage material. Such simulations will not be valid if the used material data is not describing its behavior in a correct way, so also for this purpose good and reliable results from the characterization are needed. 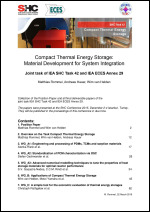 In the Task 4224, a large group of thermal energy storage experts collaborated with the aim to further develop materials for compact thermal energy storage and systems for the integration of compact thermal energy storage in heating or cooling systems. The activities were performed from 2009 until the end of 2012 and were divided in working groups, according to the structure depicted here. The groups worked on a number of deliverables, that are condensed into reports.